I gave up and added pectin, because I want to go to bed at a reasonable hour tonight, and I didn’t trust it not to spontaneously become toffee instead of jam. And then I had to strain my syrup through a sieve, because it was indeed lumpy (fortunately, I retained enough sense of self-preservation to add the pectin to just a small portion of the syrup, otherwise I really would have been in a jam) (sorry). Of course, after all that, it tastes exactly like marmalade. 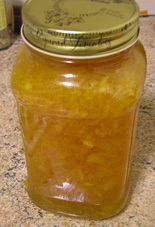 This is extremely annoying, because I already know how to make marmalade, and it is much less labour-intensive. Also, I don’t really like marmalade. I have, in fact! I’m also thinking that gingerbread could be amazing with marmalade in it. And thank you – it does have a good colour, I think. Mix the jam with pecans and make a pie? It’s a thought, though I’m not really into pecans (and Andrew actively dislikes them). I’m thinking marmalade might be lovely in a gingerbread cake. Fair enough. I was trying to think of something substantial in texture to complement the marmalade, that wasn’t too sweet. ooo yum with the gingerbread! We did get to try a lovely blood orange conserve over here (though it didn’t actually look very blood-orangey, just normal-orangey). We took to calling it jamalade, because that was about the best description one could give it – perhaps it’s just that neither of us have ever encountered orange jam before, but it was rather fascinating.